The contrast between Utah’s Native and frontier cultures and its religious roots make the state’s history contested ground. In this collection of his short works, David L. Bigler accepts a historian’s obligation be as strictly honest and as balanced as possible. His crisp, engaging narratives seek to recreate an authentic image of the past that help us comprehend the hopes and aims of all who lived it. Confessionsof a Revisionist Historian covers the issues and events Bigler considers central to understanding Utah’s colorful history: Millennialism, the march of the Mormon Battalion, the California Gold Rush, the Mormon Kingdom of God, Brigham Young’s Indian policy and the Fort Limhi mission to Oregon Territory, the 1856 Reformation and the origins of the Utah War of 1857, and the conflict’s most controversial acts of violence, the Mountain Meadows Massacre and the Aiken party murders. His analysis incorporates sketches and close studies of overlooked but significant personalities such as Garland Hurt, Nephi Johnson, Benjamin Franklin Cummings, Lewis W. Shurtliff, Benjamin Franklin Ficklin, and John Hawley, plus celebrated and colorful Danites such as Bill Hickman and Porter Rockwell, and tributes to friends and colleagues Harold “Hal” Schindler and Jerald and Sandra Tanner. 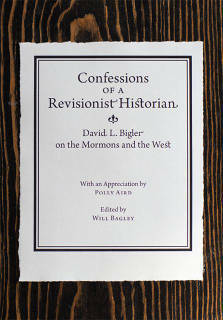 In his characteristically good-humored and gentle way, Confessions of a Revisionist Historian includes eighteen articles, essays, presentations, tributes, and a love story that showcase what fellow historian Polly Aird called Mr. Bigler’s “legacy of path-breaking research, honesty, and historical integrity.” This work stands as an enduring tribute to a gifted chronicler’s ability to examine the facts, step outside the box of the venerated interpretation, and evaluate the evidence in a new way, offering original insights into the significant human events that define today’s American West.